Sure there are a ton of families that come to the Great Homeschool Conventions. Kids pop by the booth for chocolate or to ask me if I am the “chicken lady?” (A reference to the rooster crow here.) They are a ton of fun — and don’t even get me started on all those babies and how delicious they are to snuggle. I’ve also met some pretty cool dads on the circuit this year. Dads with fascinating jobs like freelance writer, a dad who is the brother of a local friend, and even dads who took the time to pray for me. Dads are cool. 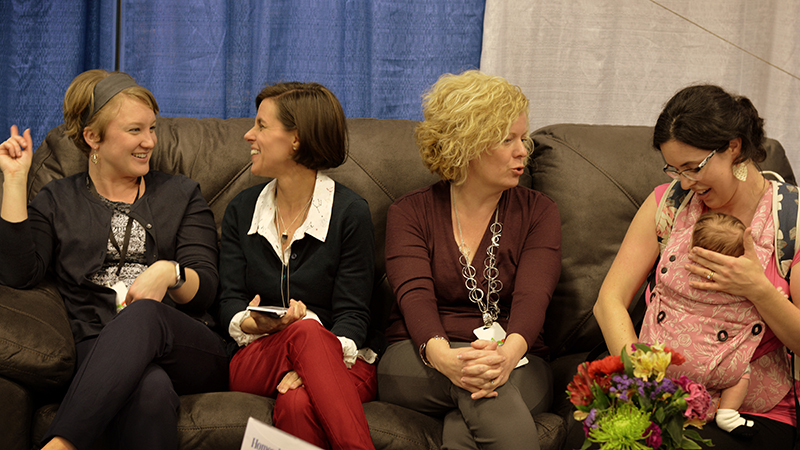 But for me, the Great Homeschool Convention is all about the moms. I’m not the only one who feels that way. 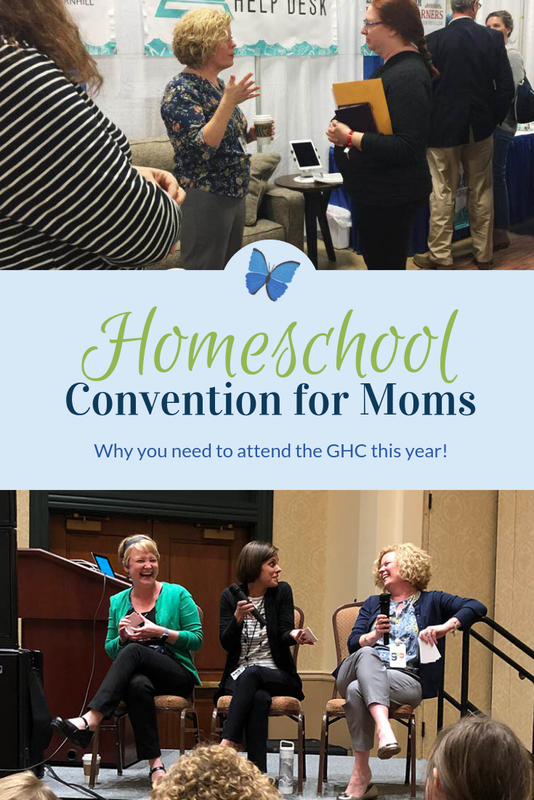 Moms are the heart of homeschooling, and I am so proud that GHC realizes that the best people to minster to homeschool moms are (wait for it) other homeschool moms. That is why when we brought them the idea for the mom-to-mom panel they were so quick to say yes. 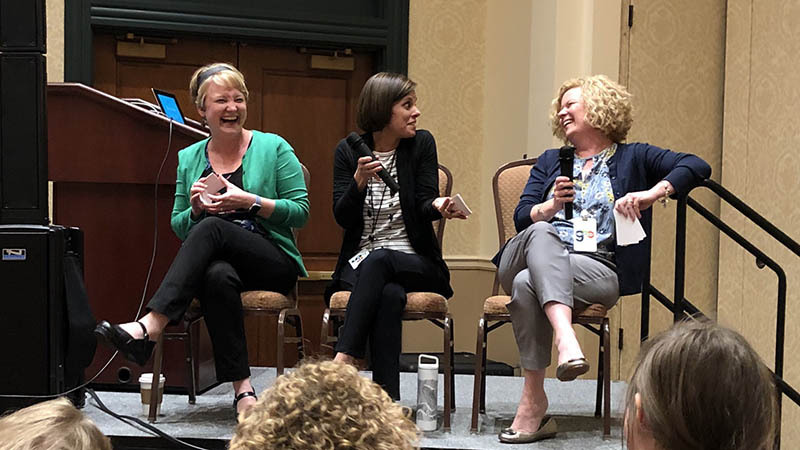 The panel is a chance for moms to kick up their feet, laugh a little bit, and rest their weary brains for a few minutes. 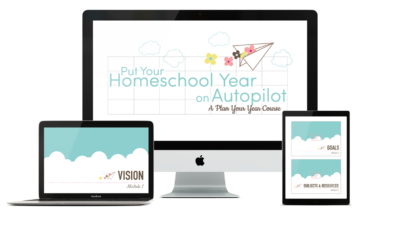 A homeschool conference is a wonderful time of learning about your favorite homeschool method, how to fill out a transcript, or the best way to learn a foreign language. There are even meet and greets with your favorite authors or fan encounters with your favorite math curriculum developer. But sometimes you just need to unwind. Have a little chocolate. And be reassured that what you are doing is good work simply because you are doing your best and showing up each day. Sometimes, between the three of us, we even manage to provide helpful answers to the questions you ask. Ahem. Mom of four homeschool grads (all boys!) 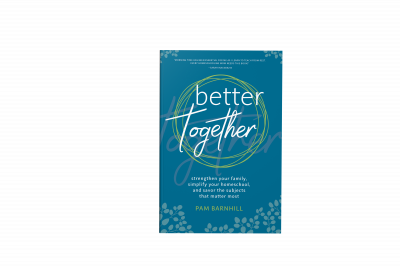 Janice Campbell provides practical advice for the new homeschooler and the mom of high school students at every conference. 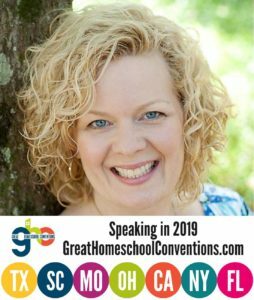 Hip Homeschool Moms (sign me up for that designation) Wendy Hilton and Trish Corlew encourage and inspire about special needs homeschooling and learning through experiences. Jennifer Cabrerra is on hand to do what she does best — tickle your funny bone. Mom (and Dr.) Melanie Wilson is there with support for motivational and anger issues — for moms and kids. 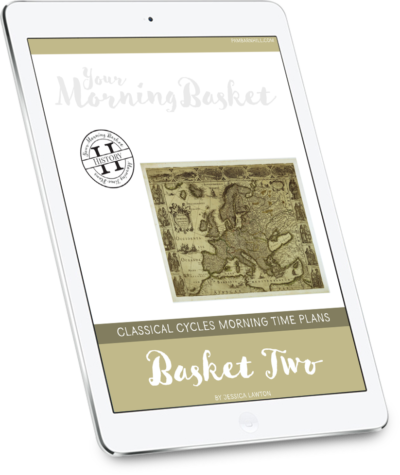 Charlotte Mason-mom extraordinaire Brandy Vencel is on hand to help you dig deeper in to putting CM’s principles into action in your homeschool. Connie Albers has advice for homeschooling teens plus a new book. Ann Karako who will be in Cincinnati to teach you that it is not that hard to homeschool high school — really! These ladies get it. 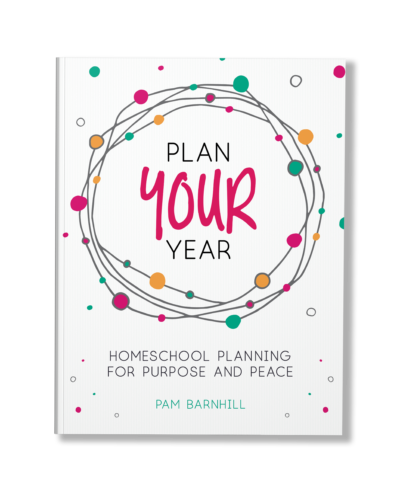 They know what it is like to pour your heart into your home and come out on the other side wrung out with fatigue, fear, love, accomplishment, worry, despair, laughter, pride and the 547 other emotions we feel at the end of any given homeschool day. 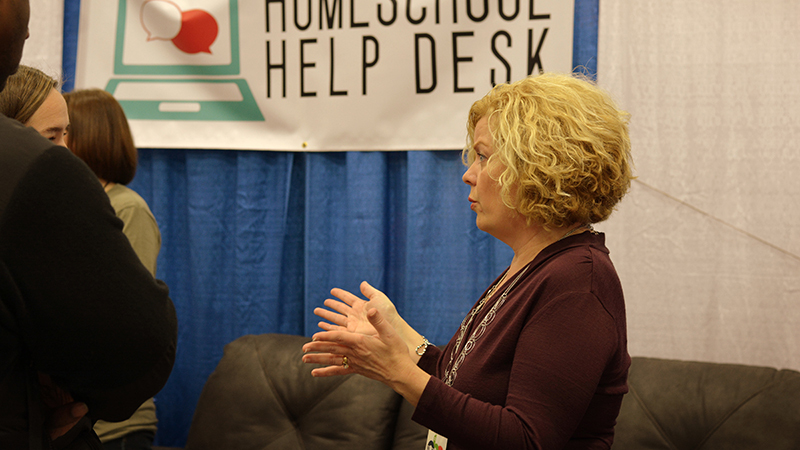 Beyond that, I am exceptionally proud of our volunteers who work the Homeschool Help Desk booth. These ladies volunteer hours to answer questions and provide encouragement for moms who stop by. Volunteers like Lynna Sutherland, Cindy West, Heather Tully, Kate Snow, Shawna Wingert, Dawn Garrett, Kara Anderson, and countless other “real moms” who have helpful answers of things that have worked for them. Seriously, this is one of my favorite places to be. 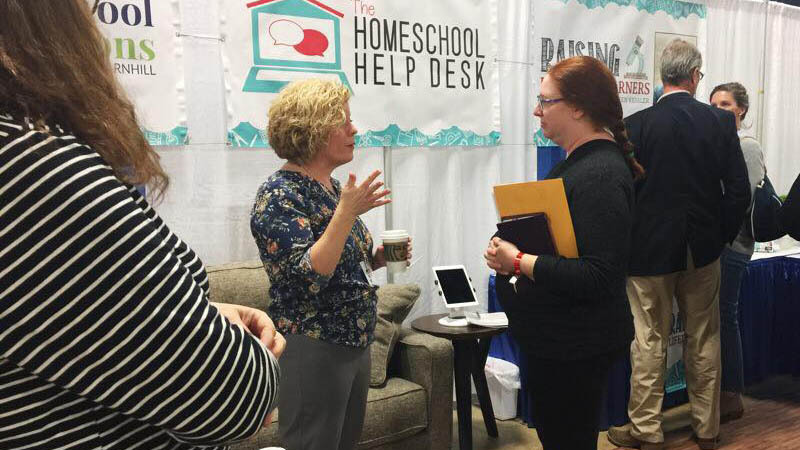 If you have not considered a homeschool convention this year, consider a Great Homeschool Convention. I will be at every single one of them, and I would love to see you there. Click here to register today. After all, mom, it is all about YOU. Photos in this post by the lovelies — Jen Vail, Heather Tully, and Jenny Freehardt. Thank you ladies!